You can do this by clicking the Home tab. 2Click the Add an Account button. The Add an Account button appears in the lower-left corner, by the way. Quicken displays the Add Account dialog box. 3Click the Credit Card option link to tell Quicken you’re setting up a credit card account. Quicken displays a dialog box that asks for the name of the credit card issuer. The first identify your financial institution dialog box lets you enter the issuer name or part of the name in a text box or lets you select your bank from Quicken’s list of popular banks. After you identify the bank issuing the credit card, Quicken prompts you to provide your online username and password. 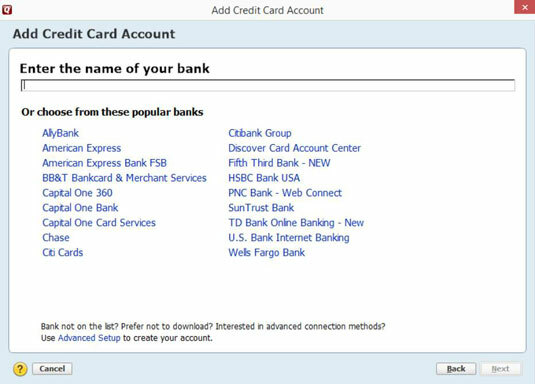 If you don’t want Quicken to make online connections to your bank, you can click the Advanced Setup link (at the bottom of the dialog box) to indicate that you don’t want to identify your credit card issuer. When Quicken displays the dialog box that asks whether you want to download transactions or manually enter them, select the I Want to Enter My Transactions Manually option button and click Next. 4Name the account and then click Next. When Quicken displays the dialog box that asks you to give a name to the credit card account, move the cursor to the Account Name/Nickname text box and type a name. In some flavors of Quicken, this dialog box also supplies option buttons you can use to indicate what you use the credit card for: Personal Transactions, Business Transactions, and Rental Property Transactions. 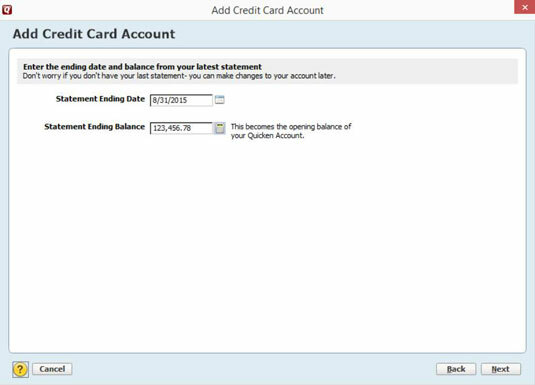 After you click Next, Quicken displays the Add Credit Card Account dialog box that lets you provide the account balance on a specific date. 5Enter the date on which you’ll start keeping records for the credit card account. You probably should choose the date of your last statement, as Quicken suggests. Move the cursor to the Statement Ending Date text box and type the date in MM/DD/YYYY format. August 31, 2015, for example, should be entered as 8/31/2015. 6Enter the balance you owed at the end of the last credit card billing period after making your payment; then click Next. Move the cursor to the Statement Ending Balance text box and type the balance value by using the number keys. 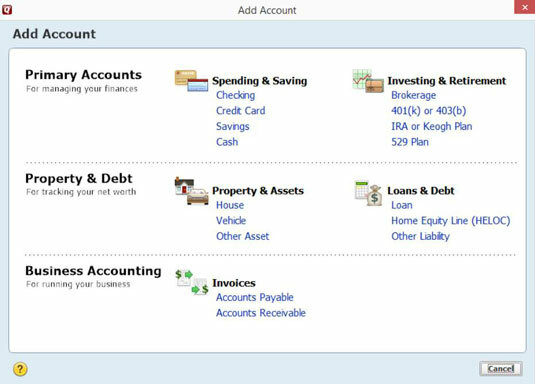 After you click Next, Quicken displays a message stating that account setup is complete. 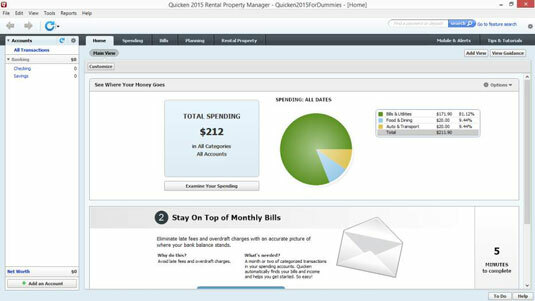 Quicken finally gets the message and redisplays the Quicken home page. As you complete credit card account setup, Quicken may also display a message that urges you to sign up for your credit card company’s online banking services. For now, ignore this message. If you want to sign up later, just tell your bank, and it’ll help you get set up.